What do Casey Harrison and Mica Baxter have in common? Apparently pretty much everything. Having known each other since high school, the two peas in a pod, long-time friends and business partners, are a couple in every way but one. That line hasn’t been crossed, due to Casey's industrial strength walls, and set in stone conviction, against becoming romantically involved with a friend. 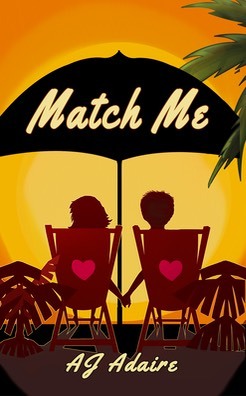 Hilarity ensues as Mica convinces Casey to enter a contest run by a new start up lesbian dating service called Match Me. The prize, a romantic vacation for two on an isolated island near Key West is at stake, and Mica wants to win it big time. Casey, feet dragging all the way, finally succumbs to Mica's pleading and agrees to participate. It is said that getting there is half the fun, and that adage is certainly true about Casey and Mica's journey to their paradise island and, just maybe, something more. Will the two self-described 'unluckiest people in the world', be able to overcome all the obstacles, real and perceived, that stand in the way of their happy ever after? Only time and fortune, will be able to tell in this romantic comedy.